The house, like so many others, has evolved over a number of generations. The central part was originally three cottages in the eighteenth century. In 1830 the front wing was built and the central part 'smartened up', in the 1880’s the north wing was changed to make it look more symmetrical. The transformation was only brought to light when some photographs, taken by a descendent of the owners of the house in the nineteenth century, were found. The Robinson family came to Moor Wood in 1911, Captain Claude Robinson was attracted by Moor Wood's close proximity to Cirencester Park where he could play polo. Sadly his dream of a sporting rural idyll was short lived when he and his ponies went off to France upon the outbreak of the First World War in 1914. Moor Wood is currently home to Mr and Mrs Henry Robinson and their grown up children. If it is true that houses evolve, then it is even more true of gardens. Mr Robinson will always tell you "we have progressed from straight gardening to more ‘landscaping’ this valley." Sadly, gone are the days of full time gardeners and groundsmen to tend to every flowerbed and rose. Nowadays its a question of managing the garden along side family life and busy jobs, Henry and Susie can often be found in the garden at the weekends and are grateful for the additional help they receive one day a week from Kasia and Keith. Over the years much has evolved in the garden, three lots of overhead wires have been buried and three rusty corrugated iron farm sheds have come down. Several old borders and two island beds, which were proving impossible to keep up, have been taken out. Susie calls this horticultural simplification her ‘ungardening’. 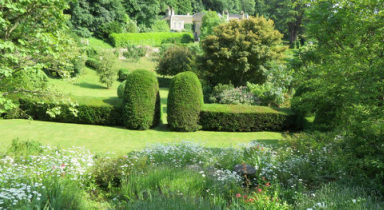 In the mid 1990’s, with some invaluable help from dear friend and garden designer Mary Keen, Susie redesigned the garden in front of the house. The gate was put in at the end and the box hedges were planted, since then it has largely remained the same. An enormous amount of time and work was put in by an exceptional gardener, Ian Thackery. Ian sadly passed away in November 2013 after a long illness with Motor neurones disease. He is greatly missed by both the Robinson's and the garden.